Mission Statement The Sedona Chamber of Commerce is a voluntary organization of businesses and individuals working together for the betterment of the community and its business environment. The Chamber is vitally interested in the economic well-being of our community and its members. We recognize that the basis of our economic well-being is this area’s unique natural beauty and small town character. We are committed to enhancing these resources as we work to support commercial and civic interests in our community. Services and Projects Sedona Chamber of Commerce serves its members by offering programs that maintain and enhance member businesses while impacting the economic base of Sedona's business community. The Chamber helps augment business development, helps business people build professional skills and provides valuable networking and exposure opportunities for members. 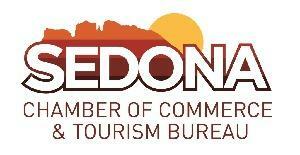 In addition, the Chamber provides visitors to Sedona a Visitors Center in uptown that provides information about our members, what to do and where to go during their visit to our community. Description: Located in uptown Sedona on Forest Rd, the Visitor Center offers information about what to do in Sedona, Chamber members, Red Rock passes and more. Professional staff and volunteers are available to answer all your questions about Sedona. We would love to partner with all the Nonprofit organizations in the Verde Valley! We can help promote organizations, events and needs! Call us or come by our office at 45 Sunset Drive, Sedona Arizona!